A string of lustrous golden beads, perfect rounds that glisten and glitter, has become one of the most eye-catching pieces of jewelry today. It outshines pure gold necklaces, with the grace it adds complementing all types of attire for every occasion. The golden pearl once extremely rare, is now being increasingly cultivated in countries like Australia, Indonesia and our very own Myanmar. The golden pearl is the newest addition to Myanmar’s vast repertoire of gems from rubies and sapphires to spinel and amethyst. Myanmar’s cultured South Sea golden pearls became popular after a single pearl was sold for USD 30,000 at a private auction in Hong Kong. Though Myanmar had been participating in international auctions and sales since the early 2000s, the first decade did not include high quality pearls, and were sold at lower prices. Gradually, the quality of pearls being cultured has improved phenomenally, and now Myanmar’s golden pearls participate every year in the Hong Kong jewelry show, besides local shows that attract international buyers. The pearl is one gemstone that is appropriate for every occasion, never ostentatious, always understated in elegance, at once adding grace and charm. From Daw Aung San Suu Kyi to Michelle Obama and Hilary Clinton, pearl strands adorn the neck of millions of women, at the work place and beyond. Pearls are known by numerous names, as the queen of gems, the gem of the moon, drops from heaven and so on. White pearls have an astrological significance and are believed to bring peace to the wearer. The quality, value and beauty of pearls is determined by the color, luster, size, shape, nacre and surface. Pearls are sold in ‘parcels’ made by sorting similar pearls and vary in value accordingly. The most common are white pearls, but increasingly now, pink, grey, golden, black and various other colored pearls have flooded the market. Natural or cultured, real pearls from saltwater or freshwater come in wide ranging price levels, from USD 50 – 50,000 and more. Pearls are the only gemstone that can be called organic, produced by a living creature. They come in various shapes and sizes, different shades and lusters. The best pearls undoubtedly are the natural pearls, which are made up of nacre, right till their innermost core. The pearl is completely made of calcium carbonate. These are also the most expensive and scarce, since only one in 10,000 wild oysters yields a pearl, which again is seldom of the shape, size and color needed for it to qualify as a piece of jewelry. Natural pearls coming out of wild oysters are difficult to find since these pearl producing oysters were hunted decades ago, to near extinction. Pearls are naturally formed in the shell of an oyster, when any irritant enters a mollusk. The oyster, in self defence secretes a substance called nacre, over the irritant. Layer after layer of nacre leads to the formation of the pearl. Pearls are now cultured and formed due to human intervention. Trained technicians (the Japanese being the best, with an 80% success rate, seeding 600 oysters a day) insert an irritant, a mother-of-pearl bead, or nucleus into the oyster, along with a small piece of mantle tissue. The mantle tissue is a piece of lining of the mollusk that will prevent injury by surrounding and protecting living creature in the shell. The tissue also contains the cells that induce production of nacre which will eventually cover the bead. It takes 4-6 years to harvest a pearl, and the same oyster can be seeded 2-3 times in its lifetime, before being left in wild waters, free from captivity. The demand and beauty of the pearl has made it into a flourishing industry and human intervention into the natural process has helped to increase production of pearls, though these are cultured pearls. Cultured pearls can Akoya, South Sea or Tahiti. Akoya pearls are cultivated mainly in large pearl farms in Japan and China, are white, cream or grey in color, and grow to a size of 2mm-10mm, over a period ranging from 8 months to 2 years. The tropical waters of the Pacific Ocean around countries including Philippines, Australia, Indonesia and Myanmar, are ideal for cultivating the fine, larger South Sea pearls. These have a thicker coating of nacre and grow to a size of 10-15mm in shades of white, cream and yellow (this is the famed golden pearl). Black Tahiti pearls are cultivated in French Polynesia, in a group of 5 island archipelagoes. While called black, they are in various shades of dark grey, with blue, green, violet and other color tones. Freshwater pearls are found all over the world, but particularly in the US, Japan and China, in streams, rivers and lakes. The typical size of these pearls ranges from 4mm to 10mm. Freshwater pearls are different due to their thicker nacre, different shapes and colors, and take 2-6 years to be fully formed. Freshwater mussels interestingly, can produce more than one pearl at a time, unlike their saltwater counterparts. Myanmar’s golden pearls come with a unique pinkish, apricot hue, a thicker layer of nacre and large size, and are widely perceived as the best in the world. Myanmar produced a total of 687,000 pearls in 2017-18, showing a 10% increase in number in three years. Pearls are sold loose in lots or parcels, and also as finished ornaments. The pearl industry is managed by the Myanmar Pearls Enterprise (MPE) that comes under the aegis of the Ministry of Mines. It is responsible for the sale of pearls through auctions and exhibitions, and participation in jewelry exhibitions in Hong Kong and other places., where they fetch high prices due to their quality. The industry is regulated and valued at over USD 100 million, even though it pales in comparison to the richer jade, ruby and other gems’ industries worth billions. Golden pearls being in the limelight is a very recent phenomenon. While being famous in the 1800s for their natural golden hues collected by the nomadic locals called sea gypsies, pearl production fell for a few decades, before being revived again. Today, there are 9 domestic and international pearl culture companies, including a state-owned one, which together invested around one billion kyat to resume pearl cultivation. The Myanmar Pearl Law has also recently been amended to permit foreign direct investment. Within the country, the golden pearls can be purchased at various retail outlets in Yangon and Mandalay. The retail sector is flourishing, though it is not unusual to find dyed pearls to get better prices. The dyeing process does not indicate poor quality, but does differ from original shades of even cultured pearls. Myanmar is one of the few countries whose pristine clean waters around the 800 islands of the Myeik Archipelago are the ideal cultivating place for South Sea pearls. Both white and golden pearls are produced by local water inhabitants, the Pinctada maxima oyster. The gold lipped oysters produce the golden colored pearls while the silver lipped ones produce white and silver pearls. Generally, a clean local environment produces the best quality pearls. It is therefore imperative to preserve this clean domain, despite the promotion of tourism in the area, while finding other ways to enhance and maintain the golden pearl quality. Pearl cultivation in the Myeik Archipelago has been revived with the help of companies and expertise from Japan and Australia. Pinctada maxima oysters, both male and female are placed in water tanks, and the fertilization process takes place only between January and May. Collector ropes are also placed in the water, to which the larvae get attached. These ropes are then left in an area of the ocean that’s been cordoned off from ships and fishermen. It takes two years for the oysters to grow sufficiently to be seeded. Japanese technicians have now trained Myanmar locals in seeding techniques ensuring similar success rates. The seeding process needs precision and speed, to open the shell to place a nucleus without injuring the living being inside. The oysters are then released back into the waters. It takes four years for the pearls to be ready for harvest. After four years, the golden pearls are cautiously removed by opening the shells again, and another nucleus implanted. In its lifetime, this process can be repeated at least three times for every oyster. Golden pearls are among the rarest of pearls, and also amongst the largest in size, going up to 12-14 mm in diameter. The shades range from bright golden akin to 24 carat gold, to a soft champagne hue, which is lighter but no less regal. Myanmar is the ideal cultivation ground to reap a rich harvest of these golden beads, which will yield the much needed revenue to aid economic growth and development in the country. Living in Myanmar is a different experience. The whole country is quieter, calmer than the rest of bustling Asia, beautifully, naturally green, with an unparalleled aura of peace. This is seen even in its biggest cities like Yangon and Mandalay, which have all the features of buzzing commercial centers, and yet have a soothing effect. It’s the tranquil air that touches deep, and most who experience it, opt to stay on. A far cry from lives many of us have left behind, to set up homes in Yangon, we now shun the noise, frenzy, stress and rush that is a part of daily lives in places not far from here. Many of us have turned to Buddhist meditative practices, and now understand how little we need to survive, and while we have not yet renounced material belongings, the craving for more, has dissipated. The peaceful ambience has to be witnessed and experienced in person, to comprehend what it means to have a calm existence, without any rush or frenzy, without noise and pollution, without panic and chaos of multitasking which at best, yields half-baked solutions to multiple issues. The people also appear so calm and gentle by nature, there are no loud haranguing voices, no shouts and fights, only soft sounds of conversations even in cafes and tea shops. This can be attributed to their Buddhist beliefs, with 90% of the population following Buddhism. Meditation is a way of life, an essential that they turn to, frequently, and most people try to take a few days off annually, for mediation retreats in monasteries in some part of the country. 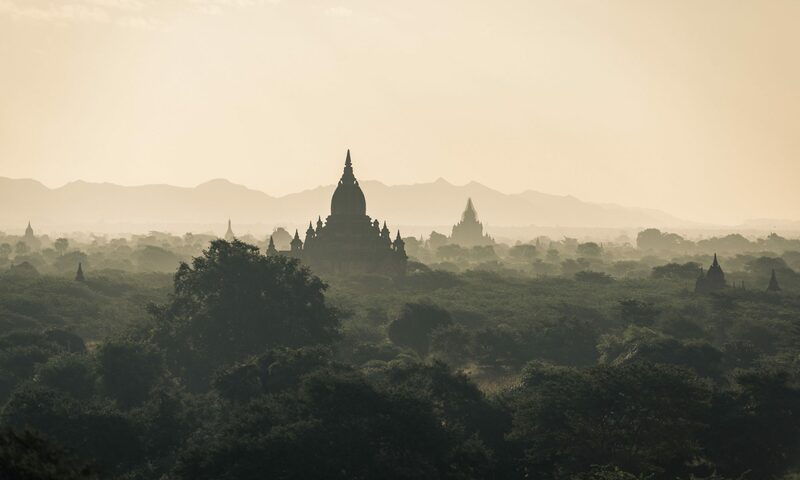 Myanmar’s association with Buddhism and meditation is centuries old, actively supported by royalty down the ages, and meditative practices were passed on from masters to disciples, generation after generation, and never getting lost. The Vipassana technique of mediation, though originated in India, continued only in Myanmar in its pristine form, while getting lost for centuries where it started. Today, mediation in various forms is spreading all over the world, and many of those carrying this torch have taken their first steps on this path, in Myanmar. Yangon then, is the ideal, perfect place to learn meditation, with its numerous meditation centers offering comfortable though basic living facilities, and these too, free of cost. Any donation made to compensate for expenses is highly appreciated but remains optional. It is only if one goes for a mediation course that combines yoga, nature walks and meditation and is organized by travel agencies, that one has to pay, depending on the duration and quality of living quarters. There is always an urge to improve as human beings, meaning that we would like to get rid of our bad habits, vices, negative thinking patterns, and develop a pure mind, far removed from venomous thoughts, ill-feeling towards others, and never wanting to hurt or harm anyone by our words and actions. This is possible only if we develop a razor-sharp mind that stops us before we make a wrong move or utter hurtful words, develop empathy and move towards a high level of purity that touches the core of our being. Meditation is the only way to self-purification. Asian cultures have inculcated a need for spiritual elevation as one gets on in age. However, in recent years, the spiritual journey for many, begins once they cross twenty and seek a meaning and purpose in life, beyond the material and the mundane. All the meditation centers have a significant number of disciples in their twenties, and some even conduct special courses for teenagers. Our lives that focus on the physical and material cause only pain, misery, jealousy, craving and aversion. Spirituality and its pursuit lifts us above these. Meditation is the route to freedom from all misery-causing factors, like the ego, which is often the root cause of all negative sensations and aversions in our body. Forgetting the “I” and overcoming self-importance is the only way we can reach the stage of non-self. In the present age, self has become most important and all our actions are about self-gratification, the rest of the world ceases to matter. Mediation helps us make our mind calm and through introspection, looking inwards rather than outwards, we achieve peace. It involves different ways and methods, though the end goal is the same, achieving peace and rising above misery. One can focus on an object, a part of the body, an action like walking, but all the time, being mindful. One practices moment to moment awareness of the physical and mental state, observing every sensation that arises and passes away. This helps us understand how impermanent everything is, every feeling that comes, goes away, whatever begins will come to an end. We observe and we understand, and eventually imbibe this well enough to apply this truth to every aspect of our daily life. Meditation need not stretch for 24 hours, day after day. It has to be learnt, and then practiced, preferably daily, whenever one can spare the time. It does require quiet surroundings to facilitate concentration, at least initially, till one has reached such an advanced stage that noise and surroundings no longer distract. There is always a long waiting list of prospective students of meditation, both local and international. Before enrolling at any center, it is important to know the precise meditative practices taught and practiced at each of these, and see which one we resonate with. Some teaching walking and sitting meditation, both being an exercise in mindfulness. All the centers have comfortable living quarters, separate for men and women, provide simple, nutritious food, and basic facilities to accommodate new and old students. The rooms do not have any phones and it is generally recommended to not carry laptops, smart phones, books or reading material. Communication with the outside is possible through the office which has international calling facilities, fax machines etc. Doctors are available for medical emergencies. Most centers teach Vipassana using the Mahasi Sayadaw method. Dhamma Joti Vipassana center was set up by S N Goenka and follows the tradition of Sayagi U Ba Khin. In most centers it is possible to receive instructions in English as well. Every year, thousands of international and local students of all age groups enroll for courses in these centers. The daily practice begins at dawn though timings of different centers vary, and continue till nearly 10 pm, with breaks for food and rest. There is time for individual mediation and group sittings, and teachers are available for improving the meditation technique and resolve doubt. For the few days spent in these centers, living is confined to one’s own physical frame, where one focusses on mindful actions of oneself, and not interact with others at all. Even eye contact is avoided. Students are expected to adhere to the rules and regulations of the center, follow the eight precepts, practice noble silence, and eat twice a day, abstaining from eating after noon time. Beverages are offered in the evening. This gives us a sense of how little we need to survive, and how wasteful our lifestyle is, in the outside world. This may appear tough as an outsider, but once we step in, the purpose spurs us on, and the focus is on learning alone. For those wanting complete solitude away from the city, can opt for the few forest retreats in Myanmar, like the Pak Auk Forest Monastery in Mon State, and the Panditarama Forest Monastery not far from Yangon. In six years that I have been here, scores of restaurants have opened and tens have shut down as well. The initial foot falls are high and the quality of food appealing. But gradually we find many of them with few diners, somewhat deserted, and one day, the place shuts down, sometimes taken over by another eatery. Public memory is short, and names are soon forgotten too. The ones to stay include Rangoon Tea House, Nara Thai, Corriander Leaf, Marina, Thai 47, to name a few. the reason for their staying alive, isn’t difficult to gauge – their quality has remained the same over time, and they have made improvements based on customer reviews. Foodies I guess, I wish to replicate experiences, savor their favorite dishes and expect the same taste, aroma and flavors each time. Some restaurant experiences leave a lot to be desired, but over time, we have learnt to scale down our expectations and be more accepting of what comes our way. This is also in keeping with the Buddhist way of life, to be equanimous, non-reacting and less critical, and we find ourselves becoming softer, less aggressive and hence improving as individuals. For me, the best pizzas are still at Parami Pizza, even though many new Italian restaurants have opened. Sharky’s pizzas are good too, but Parami scores higher. We are not partial to the Americanized versions with thick crusts and an overload of cheese and other toppings. Even the soups, salads and meats are cooked to perfection, the pastas creamy but light, while L’Opera has very rich sauces that overfill. The best Chinese still at Dou Hua, the Chinese restaurant on the first floor at Park Royal Hotel. Buffett and a la carte selections offer variety and it is difficult to find fault in any of the preparations. The familiar, friendly staff adds to the warm ambience. For Thai I like Nara Thai even though their omelet isn’t as sinfully deep fried. The ambience is appealing, clean, spacious, and attentive staff, which is a welcome change from older Thai eateries that look dated and somewhat musty. However, of late, there have been complaints about a change in the food being served. Gekko, quite the favorite for Japanese cuisine, is a bit difficult to find, without a conspicuous name board outside, one misses it despite being right in front. Like a typical bar, it is dark on ground level, loud music, and not quite a place for both food and conversation. If its just food, then the ultimate is, to use Yangon Door2door to deliver the cuisine of your choice, at your doorstep, to savor in the comfort of your home. This concept of home delivery has transformed the food scene in Yangon and has become extremely popular in a short span of time. The list of restaurants covered is getting longer, and their earnings from the restaurants not the customers. Is Yangon Sliding Under Urbanization Pressure? Yangon’s crowds are growing and the numbers on the roads are increasing, be it vehicles or people. IS Yangon overcrowded? Yes, very much. Parks are packed with people taking a break, the sidewalks with pedestrians, and the roads with more vehicles than Yangon has ever seen before. All this is in stark contrast to the Yangon we saw in 2013, when its seemed the most refreshing place to live in, a very green, quiet and serene city with an aura of peace that permeated the inner most core of our being, a few cars, a few people, and there was sufficient room for all. Anywhere I went, there were vast open spaces, quiet corners and empty roads. Fast forward to 2018, one look at Yangon now, and this would seem like a fairy tale. Yangon today looks like any other big Asian city, with its traffic jams, congestion, pockets of densely populated areas, emerging slums, crowded streets and people spilling everywhere. The once neat and clean city, is often seen with littered sidewalks, broken pavements and everything one sees in a place that cannot take the load of the number of people occupying it. The transformation can be attributed to a series of factors linked to economic development, which brings with it, urbanization, industrialization and modernization. Migration from rural to urban areas is one of the first phenomena ones sees. Yangon’s pristine aura of peace, enigmatic charm, unparalleled scenic beauty, colonial heritage and elusive old-world charm, has made it a top tourist destination and the most popular city for the people of Myanmar. As the country’s biggest urban center, Yangon has charmed one and all. Once the center of art and education, Yangon has been changing and evolving, for better and worse. Today, it is a city that is ready to burst at its seams, stretched to provide basic amenities and subsistence to a rapidly growing population. It is rapidly emerging as a cosmopolitan, commercial hub, providing jobs, homes and livelihood to locals and expatriates alike. Yangon is the country’s commercial capital, with the best quality of life, and the first stop for everyone entering the country. Yangon being the largest city, has 8% of the country’s total population, the number of people being four times more than those living in Mandalay. This accounts for nearly 52% of the country’s total urban population. The current population growth rate of 3.4% per annum, will take the city to the 10 million mark by 2030. For Myanmar folk, it is the land of opportunity where the best of education, job opportunities and healthcare facilities are available. Yangon accounts for 50% of the country’s industrial capacity, is the largest financial and commercial center, the seat of education, art, culture, healthcare, tourism, research and development. Yangon’s character has changed with bridges and flyover, vertical high rise structures rising alongside pagodas, housing sector expanding, shopping malls and multiplexes mushrooming all over the city. Urbanization in Myanmar has been pushed due to challenges faced in rural areas. With employable population increasing, earning money has become difficult, since there is lack of sufficient land to employ everyone, old farming techniques still being used, threat of natural disasters and difficulty to overcome past disasters, and lack of work opportunities beyond agriculture. The urban pull emanates from better job opportunities in various fields and higher minimum wages. Evidence shows that urbanization peaks when city wages exceed rural earnings, and revenue from natural resources becomes stagnant with limited potential for growth. Myanmar’s urbanization process has radically changed two big cities, Yangon and Mandalay, and urban population accounts for 34.65% (2016) of the total. Over 50% of the 11,000 registered firms in Myanmar, are Yangon based. Industrialization which incorporates manufacturing and services, is a big driver of urbanization and this holds true for Yangon. As a result, migrants from all parts of Myanmar come to Yangon looking for jobs and earning options. Theoretically, urban hubs are the perfect meeting place for talent and opportunity, but lack of a qualified, educated and skilled work force, is an issue. Consequently, jobs which do not require high skill levels are easier to find. Often such jobs do not pay well enough to provide subsistence to families, despite the fact that government-stipulated minimum wages are paid. The result is, search for cheaper accommodation, the growth of slums, and squatters seen in all parts of the city. Slums are informal, temporary, non-pucca hutments or shanties that crop up in clusters, wherever there is free space, generally on the fringes of cities. Unofficial figures indicate that a quarter of Yangon’s population lives in slums that have cropped up in suburbs. An influx of tenants leads to an escalation of rents in the city areas, and pushes the poorer section further away towards the outer parts. Most slums are overcrowded, unhygienic with limited access to clean water and adequate sanitation facilities. Housing space per family is generally less than 200 square ft, the construction type being wooden frames with leaf roofing, temporary and vulnerable to the elements. Hlaing Thar Yar township has the highest number of slum dwellers, most of whom have migrated from the Ayerwaddy Division. Myanmar is one country whose urban poor are worse off than the rural poor. This is because urban living requires cash for everything and nothing comes free. In rural areas, there are no payments needed for a lot of things that come free, there is exchange and barter, and very few people sleep hungry in villages. The same does not hold true for Yangon’s squatters. Their living conditions are in sharp contrast to the middle and upper classes, and the contrast between the haves and have-nots, is the ideal breeding ground for petty thefts and crimes. The opening up of the country, the influx of foreign goods and capital, the emergence of shopping malls and entertainment areas, has evoked interest from the once content and complacent population. There is a desire to acquire the latest in fashion goods, devices and gadgets, and get a taste of all that Yangon offers. Those opting for shortcuts would resort to dishonest ways of getting these. Developing nations surge ahead on the basis of manpower that drives industrialization. There is a redistribution of population, an exodus from villages towards cities, in search of better job opportunities. Urbanization involves rural flight and expansion of urban areas, and it is almost always, driven by economic factors, since earning potential in urban areas is much higher than rural areas. Agriculture is the primary source of employment in villages in most developing countries where governments have not been able to set up small scale or cottage industries that tap local resources and add value to raw materials. Urbanization is an essential step for all nations on the path of development. Urban areas are the ubiquitous centers of education, talent, training, capability, experience and expertise-all prerequisites for industrial growth, which will lead the country towards self-sufficiency, increase productivity, generate employment, raise standards of living, increase per capita incomes, savings and investments. Thus it leads social and economic transformation of societies, improving quality at micro and macro levels. Nearly 54% of the world’s population lives in urban areas today, a far cry from 1800 A.D., when urban population was just 2%. By 2050, the United Nations expects two-thirds of the world population to be in urban areas This is because empirically, it has been seen that cities have more economic potential with their concentration of resources including capital and labor, where talent meets opportunity provided by the manufacturing or services sectors. Urban areas provide variety of opportunity on one side, and consumption on the other. Urbanization also results in high population density (the number of people living per unit of area), causing overcrowding, shortage of space, homelessness, congestion and pollution. In most developing countries, there is inadequate infrastructure, insufficient affordable housing, water and sanitation, and other basics that are a citizen’s right to lead a dignified life. The dearth of housing leads to slum creation, squatters, shanties being put up on pavements, sidewalks and under bridges, and herein fester crime and danger, out of poverty and frustration, and people take to begging just to survive. A series of push and pull factors are the root cause of urbanization. Residents of villages are forced to move out when survival becomes difficult, earnings do not cover expenses, and there seems to be no future opportunities for improvement. Hence the push factors come into play, which include landlessness, low wages as farm workers, seasonal work in fields depending on the crop, lack of alternate employment opportunities, and natural disasters that cause loss and damage. Pull factors include the facilities and opportunities that cities provide. From afar, cities appear to be like paradise and survival easy with all that they offer, better and multiple employment opportunities which are not seasonal, potential to improve skills, better education and healthcare, better infrastructure and communication facilities. These somehow camouflage the impending threats of extreme poverty, unemployment, vulnerability to crime, exposure to pollution and unhealthy elements. In the ongoing debate on the ills of urbanization, there is talk of halting the process and a search for alternatives. The solution lies in providing employment opportunities in rural areas through the setting up of small scale industries in villages where local arts and crafts can be manufactured, value added agricultural products can be produced in villages close to the source of raw materials to avoid transportation costs as well. Myanmar’s export earnings from rice, beans pulses, vegetables and fruits, fisheries etc can increase substantially if they are packaged according to international standards and sold as finished goods rather than being finished in other countries. Improvement of education facilities, setting up secondary schools and vocational training centers will also stem part of this influx into Yangon. After more than four years in Yangon, I too, like everyone in Myanmar, wait with excitement and enthusiasm, for Thingyan, the water festival. Thingyan is the biggest festival, event and celebration of the year in Myanmar. It comes as a welcome break from the hectic pace of life, and brings all activities to a virtual standstill for all, when work stops and workplaces shut down, when the mood of holiday and festivity in the entire month of April means nothing will move. Except for the water spraying pavilions, loud music and vendors feeding the hundreds playing, the city or actually, the whole country is transformed, the buzz and bustle is missing, and there is just an ambience of relaxation and fun, noise and merriment. Those who can afford it, leave the country to take a break elsewhere and catch up on all that is missing in Myanmar. Yangon is a city with character, one that charms and fascinates, despite, the aging structures that line its streets. The impeccable glistening newness of the Shwedagon Pagoda reveals the effort that goes into maintaining this exquisite structure which is perhaps the most beautiful pagoda in the world. In stark contrast, as one drives around Yangon, one sees dilapidated structures, rundown buildings, belonging to the era of British rule. They contribute as much to the character of Yangon, as the golden spired pagodas, monasteries and other architectural marvels. British architecture stands out in all the countries that were once British colonies, be it India, Sri Lanka or Myanmar. But while their counter parts in Delhi, Kolkata, Colombo and a host of other cities have been restored, maintained and preserved, Yangon sees them slowly, silently crumbling. I set foot in Yangon four years ago, and vividly remember the feeling of dread as the aircraft circled over numerous water bodies, lush greenery and pockets of habitation over vast expanses of flat land. The first three months were difficult and then we began to accept the place and its people. We began to enjoy the company of the locals with their ever smiling faces, and admire their level of contentment despite their very limited means and minimal access to comforts and luxuries. We admired the classless society, though there was respect and reverence for the learned and the elite, and we began to understand their amazing attitude and look inwards too. Change has become the only constant in Myanmar. From a country that barely witnessed change a decade ago, to have become a rapidly transforming and growing economy, Myanmar stands for optimism and hope, development and advancement…all the positives that appear once the need for embracing change is felt. The air is rife with optimism and enthusiasm, even as the local populace waits expectantly for the next set of newbies to appear.